Although the Merewether and Price report in 1930 is often cited as the beginning of awareness of the hazards of asbestos, knowledge about asbestos dangers begins much earlier. In 1898, Lucy Deane, a Lady Factory Inspector in Great Britain, warned of the health dangers of asbestos in Annual Report of Chief Inspector of Factories and Workshops for the Year 1898 Part II. And despite decades old asbestos health warnings, many U.S. military veterans from every branch of service were at risk of being exposed to asbestos and the eventual development of mesothelioma, asbestosis, lung cancer, and related diseases. Mesothelioma legal help for veterans is available and a veteran’s legal rights should be reviewed. Veterans do not have the option of filing a lawsuit against the government for damages suffered during service to their country. Yet, there is an opportunity to file an asbestos lawsuit against the company or companies that manufactured or installed the asbestos products which caused eventual development of asbestosis, asbestos lung cancer or mesothelioma. Veterans are entitled to take legal action and have a good chance of prevailing. Many thousands of lawsuits have been filed against asbestos companies for product liability compensation. If you are a U.S. military veteran and you have been diagnosed with mesothelioma, you may be eligible to receive compensation. Hiring an asbestos attorney is the first step to ensuring you secure specialized, legal representation. During the search to find the best asbestos attorney through the final results of your case, there is a best practices process of an asbestos lawsuit. The process for a veteran interested in hiring an asbestos attorney begins with contacting the firm’s “Intake” department. During this process, the firm gathers information, asks questions, and helps provide advice to veterans on the best next steps. 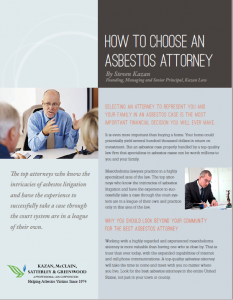 Once the firm’s investigators have historical information about a veteran’s service, background, family, and activities, an asbestos attorney interviews the veteran to determine if they have a case that should be filed. In many cases, veterans have filed suit against dozens of companies responsible for their asbestos exposure. A good asbestos attorney requests the court schedule the trial as soon as possible. If a veteran client is in poor health, the attorney will take steps to shorten the discovery process asking the judge to expedite the case by moving it rapidly to the top of the trial calendar. Placing the case on the court’s trial calendar also marks the beginning of serious settlement negotiations. Faced with insurmountable evidence, many defendants (companies) choose to begin the settlement process. When a case goes to verdict, in most cases, the losing parties appeal the verdict. The appeal process can delay the final outcome in a case for months and even years. When each defendant settles, the process of release must be signed to absolve the defendant from future asbestos litigation by the plaintiff. Other important personal decisions will have to be made by the veteran and his or her family, including distribution of settlement monies, possible estate planning, and assignment of the veteran’s assets to family members. No two mesothelioma cases are the same. There is no set formula and there can be exceptions to each one of the points made in this process outline. These are very complex cases that require a good asbestos attorney who understands how to bring the veteran’s case to settlement or positive verdict. Proven experience is the key ingredient to hiring the best asbestos representation you can find.